In the anticipation of Russian Deputy Prime Minister Dmitry Rogozin’s visit to India in February to discuss the FGFA and other defence projects, prominent Russian expert Konstantin Makienko explains how the Make In India policy favours Russian companies and lists key joint projects to keep an eye out for this year. The Indian military equipment market is undergoing a rapid transformation. To begin with, India’s network of foreign partners in this field is widening. While Israel and the U.S. came into the Indian market in the 1990s and 2000s respectively, other military exporters such as Japan and South Korea entered quite recently. Today almost all of the world’s leading military producers (with the exception of China) are present in the country. Another trend comes from India’s rapid economic growth, which leads to a subsequent growth in the country’s resource potential and an increase in demand for expensive military equipment. Between 2008 and 2016, the U.S. sold India a number of expensive С-130J and С-17 military transport aircraft, P-8I long-range, multi-mission maritime patrol aircraft and AH-64 Apache multi-role combat helicopters. The overall worth of these deals was $16 billion. Another major deal was made with France in 2016. Within the Medium Multi-Role Combat Aircraft (MMRCA) programme, the Indian Air Force (IAF) bought 36 Dassault Rafale fighter aircraft for a striking 8 billion euros ($10 billion). They will be supplied in 2019-21. This deal is also notable given that the country planned to spend the same sum on importing 18 and manufacturing 108 aircraft in India. Yet, the third and most important trend in the Indian market is the call for localization of military production in the country announced within the Make In India policy. Given the fact that the recent deals with France and the U.S. directly contradict this initiative, Make in India is far from being implemented in practice at the moment. The first two trends make it more difficult for Russia to compete in the Indian market. Products of Russian companies are positioned on a mid-price range level, therefore, India’s switch to more expensive products, (as well as growing competition) creates obstacles for Russian exports to India. On the other hand, the third trend, that is the implementation of the Make In India policy, opens up new opportunities for Russian companies. Russia is the only country that has huge experience of licensed production of its military equipment in India. In fact, ever since the Soviet Union entered the Indian market in 1960s, Moscow worked according to the Make In India principle. Even the first projects of supplying MiG-21 second generation aircraft included a license transfer allowing their production in India. 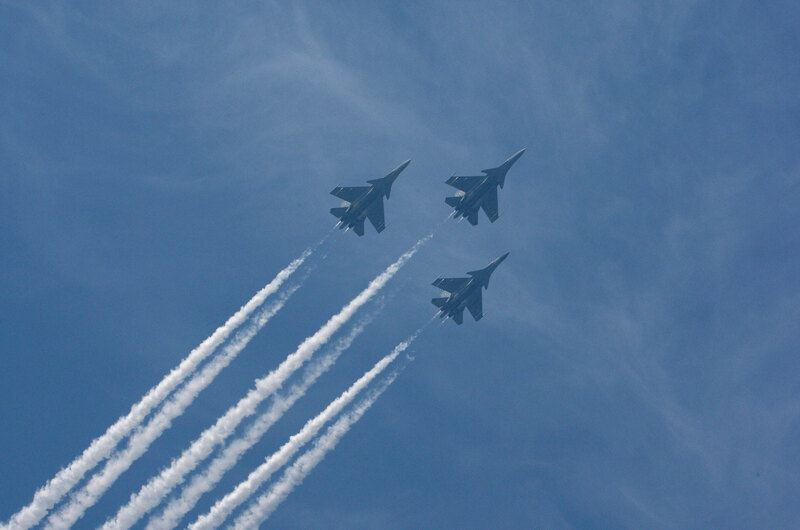 This practice continued with new MiG-23 and MiG-27 aircraft and reached its peak with the implementation of the Su-30MKI programme. Russia was also quite actively cooperating in other projects, such as in ship building in Indian shipyards, as well as in producing T-72C and T-90C tanks for the Indian Army. Notwithstanding growing competition, Russia maintains its position in the Indian market. Russia’s annual defence exports to India remain around $4 billion accounting for about 28 per cent of total exports. India is the largest importer of Russian military products, and this is not that surprising given that India is the second largest global importer of military products after Saudi Arabia and has every chance to occupy first place in the future. Russia maintains the position of the largest producer of military equipment to India, at least before the beginning of Rafale supplies. Notwithstanding the signed contracts, the U.S. has supplied $16 billion-worth of defence products to India since 2008 ­– this is an average of $2 billion a year, which is lower than Russia. One might expect the implementation of a number of joint Russia-India initiatives in the short term. First, the sides might move towards the modernization of the Indian Air Force (IAF), after they complete the Su-30MKI programme in 2019. By then the IAF will possess around 270 aircraft and all of them will need to be modernized to the Sukhoi Super 30 level. Done without any large financial costs, this will boost the IAF’s military capability while following Make In India principles, using Indian facilities. Second, there is progress in fifth generation fighter aircraft (FGFA) programme, which is a joint Russia-India project of creating, producing and marketing an aircraft that will become a centrepiece of the IAF in the 21st century. India has a serious shortage of modern aircraft (it needs at least another 180), so producing FGFA in India seems like the best way to bridge the gap between the IAF and the People's Liberation Army Air Force (PLAAF) of China, which has a growing superiority in both numbers and quality. In this situation, Russia is India’s only source of fifth generation technology that can be supplied for an acceptable price and in a short time. Third, following Russian President Vladimir Putin’s visit to India last year, the sides agreed on the supply of brand new S-400 anti-missile systems, so India will for the first time in its history possess such a sophisticated air defence system. Fourth, Russia and India will work together on building Talwar-class 11356 frigates in Indian shipyards. Russia has already supplied six ships of this type, and now the sides are talking about the supply of two more and the construction of two frigates in India. Other important developments include the agreement reached on licensed production of a large number of KA-226T helicopters in India, and New Delhi’s decision to buy 464 T-90MC tanks from Russia. With the contract on the supply of tanks estimated to be worth $2 billion, the total overall value of agreements signed during Putin’s visit to India in October 2016 might reach $10 billion. Despite the recent deal made between Moscow and Islamabad on supplying four Russian fighter helicopters to Pakistan, and subsequent public concern in India over potential Russia-Pakistan rapprochement, one can be confident that the scale of Moscow’s cooperation with Pakistan will always remain quite limited. Russia will never sell weapons to Pakistan that could potentially change the power balance in the Indian sub-continent. It is clear that the recent deal involving four helicopters is unlikely to change it. All reports arguing that Moscow could also sell Su-35 to Pakistan are false and are aimed to hamper Russia-India relations. Islamabad would want to buy these aircraft and other Russian weaponry, but Moscow is unlikely to agree on anything more than a transfer of a limited number of fighter and transport helicopters in the future. Moscow is deliberately limiting itself in military cooperation with Pakistan. It will never risk its strategic and privileged relations with Delhi. This same cannot be said about India’s other partners. The U.S. supplies Islamabad with the General Dynamics F-16 Fighting Falcon, a single-engine supersonic multirole fighter aircraft, while France supplied Pakistan with submarines. Russia and India might find it useful to focus on two aspects of their military cooperation. First, Russia should be bolder in developing its proposals in sub-strategic and strategic weaponry. This might involve the creation of full-fledged missile capability in India and a system of missile defence. This might also feature the creation of a full-fledged nuclear submarine fleet in India. Such cooperation does not contradict with Russian commercial and political interests. Second, the sides should make more steps to move from a trade model to industrial-technological one that involves joint production. The recent examples of this are BrahMos and FGFA programmes. Moscow and Delhi should increase the number and scale of such projects. For instance, it might be beneficial to integrate Russia to the HAL Advanced Medium Combat Aircraft (AMCA) programme, which is an Indian programme of a fifth-generation fighter aircraft. In the future this could allow both countries to address the growing problem of substituting medium aircraft of the fourth generation. In sum, Moscow and Delhi should aim to form a common market for military equipment. The phenomenal convergence of national interests, historic tradition of fruitful military and technological cooperation, as well as compatibility in business and industrial cultures create an opportunity to achieve this seemingly fantastic goal. Konstantin Makienko is Deputy Director of the Moscow-based Centre for Analysis of Strategies and Technologies. Views expressed are personal. Read this article in Hindi.